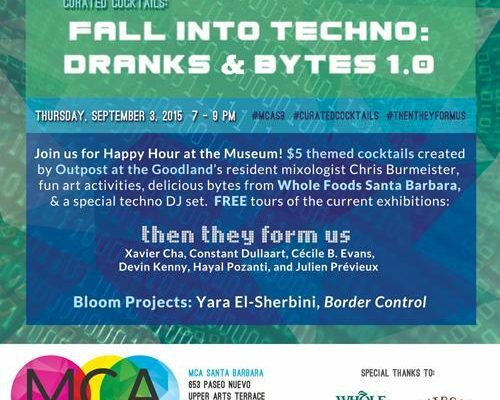 Join us for Happy Hour at the Museum! $5 themed cocktails created by Outpost at the Goodland’s resident mixologist Chris Burmeister, fun art activities, delicious bytes from Whole Foods Santa Barbara, & a special techno set by DJs Myster Mause and Watson. Sound provided by Watson Sound. FREE tours of the current exhibitions: Then they form us: Xavier Cha, Constant Dullaart, Cécile B. Evans, Devin Kenny, Hayal Pozanti, and Julien Prévieux, and Bloom Projects: Yara El-Sherbini, Border Control.